Saumarez Park is the location and scene for many formal and informal activities which may be conveniently combined with a visit to the Victorian Walled Garden. The central area of the Park forms a large grassy arena which is a popular place for picnics, having views over the pond with its Japanese style pavilion and its ducks and other birds. It’s also a popular location for informal ball and other games, and is a safe cycling location for young children. (Adults may not cycle in the Park). A children’s playground will also be found not far from the Victorian Walled Garden, Tea Rooms and Folk Museum. The Park and part of the adjacent nature trail, contain the finest single collection of trees in Guernsey, and a stroll around will be well rewarded. Interesting guided walks are available most Wednesday afternoons from May to September which touch on the history of the Park and some of its present usages. These start at 2 pm from Saumarez Park Tea Rooms and last about 1½ hours. More information about the trees is available from A Saumarez Park Tree Walk, and a description of the Saumarez Nature Trail walk is available at www.guernseywalker.me.uk. Situated in the Park, quite near to the Victorian Walled Garden and set amongst a cluster of exquisitely restored farm buildings, the Museum showcases Guernsey’s rich heritage with exhibitions covering domestic life, farming, fishing and sea-faring. Guernsey’s legendary tomato industry is also presented in an outstanding exhibition. 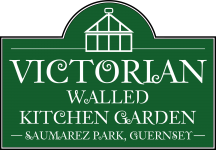 In April 2015, Guernsey Botanical Trust here at Victorian Walled Kitchen Garden and National Trust of Guernsey worked together in successfully reigniting interest in the island’s one time famous and prodigious industry. Our project Guernsey Tom was launched during the event. The Museum also carries annual costume displays from the Trust’s outstanding collection of over 7,000 items of historic clothing. Information on opening times can be obtained from the Museum, or from the National Trust of Guernsey website. Almost adjacent to the Folk Museum, Salvatore’s Câfé offers good quality and good value snacks and meals. From March each year, Salvatore’s is open from 10 a.m. through to late evening seven days per week, except for Monday evenings. The main annual events, during which an admission fee is payable to gain access to the Park, include an evening ‘Viaer Marchi’ and ‘The Royal Guernsey Agricultural and Horticultural Show’ in July, and in August a ‘Donkey Derby’ day, and the Northern Agricultural & Horticultural Society’s annual two day ‘North Show’ which culminates in the Guernsey ‘Battle of Flowers’. What’s on in the park?